Getting out of bed early has never been an easy thing for me. However, when the alarm rang at 6a.m. on May 21, 1975, I had absolutely no trouble. I was about to have the rare experience of riding a passenger train on the Western Maryland Railway's Connellsville Subdivision. One of the last previous passenger trains over this section of track was a Southern 4501 excursion two summers ago, and I had missed it. 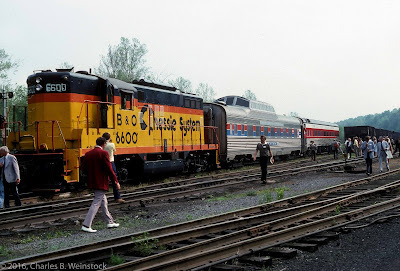 My thoughts that Wednesday included sympathy for any railfan who missed both that trip and the one I was about to take, because there would never be another chance. The Western Maryland had received permission from the ICC to abandon about 124 route miles of track, mostly from Connellsville, Pennsylvania to Hancock, Maryland, and today's train was to be the last one ever. Opened for operation on August 1, 1912, the stretch of the Western Maryland that reaches from Cumberland to Connellsville has always been a "redundant" line. 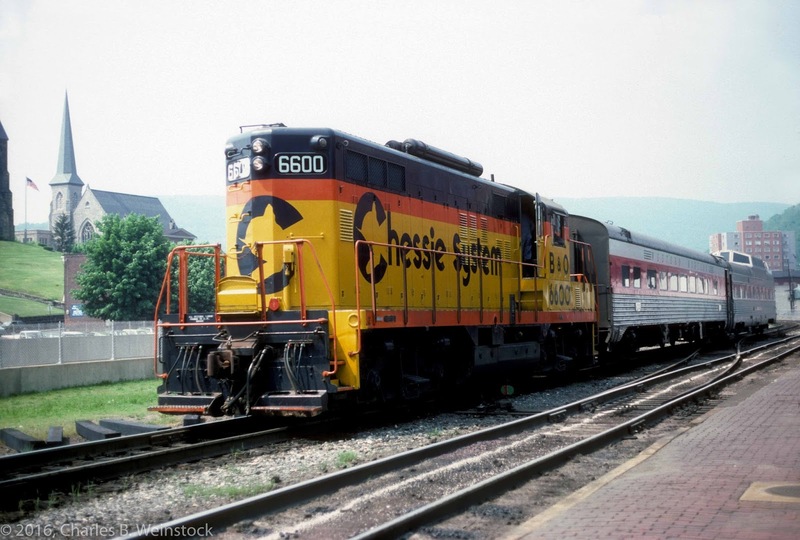 It was built to make the Western Maryland more competitive with the B&O by giving it friendly connections for Great Lakes shipping, Its connection with the Pittsburgh & West Virginia at Connellsville was to play a part in the George Gould transcontinental scheme. For most of the line's length, along the Youghiogheny and Casselman rivers, the B&O parallels it. Since both lines are now part of the Chessie System and competition is no longer meaningful here, economics dictated the removal of one line. It was decided that the Western Maryland tracks would be the ones to go because the B&O is double tracked. Besides the Connellsville Subdivision, the Western Maryland is abandoning its line from Cumberland to Hancock, and from Cumberland to a point about three miles East of Keyser, West Virginia, called Twenty First Bridge. Not one shipper will lose service as a result of the abandonment. Where Western Maryland tracks are the only ones capable of providing service, they will continue to be operated. For example, the stretch from Cumberland to Frostburg, Maryland1, and another around Blue Lick will remain in service. Despite this "clean'' abandonment, it took over a year to get the approval of the ICC. For a confirmed passenger nut like myself, the consist of the last train was almost more interesting than the route that it traversed. On the point was steam generator equipped B&O GP9 6600. This is one of three GP9's used in the pull-pull PATrain commuter operation in the Pittsburgh area. Next in the consist was Western Maryland 1700, a 54-passenger streamlined coach painted in red and white. The mural on the wall and a little plaque inside indicated that this coach was built originally for the Pere Marquette. The last car in the consist was supplied by Amtrak and was fittingly historic: dome coach 9401 (ex-CB&Q 4714) Silver Dome. Students of passenger train history will recognize this as the first dome car ever built. According to Arthur Dubin's, More Classic Trains (Kalmbach, 1974), this car was built in 1945 out of the coach Silver Alchemy by the CB&Q at its Aurora Shops. Unlike other dome cars, Silver Dome does not have curved glass. Because of wartime restrictions, the Q was forced to use flat glass. Silver Dome at Hancock. Notice the flat dome windows. As much as I enjoyed seeing Silver Dome, Amtrak should never have sent it to Pittsburgh; they should have kept it in their shops until it was put in better shape. The car suffered from a common Amtrak malady: no air conditioning. That, while not good, would have been tolerable had the dome been useable. Although the car was hand washed the night before, the plastic windows were filthy. Further inspection indicated that the dirt had been ground into the windows making them un-cleanable. A dome that you cannot see out of is useless. Putting such a car on what was essentially, a press train is unpardonably bad public relations. At least one of the railroad officials on board pointed out that the situation on our special illustrated the folly in Amtrak's priorities. He felt that, after making the cars safe, the first priority should have been to make them comfortable (mainly by making the air conditioning and heating systems functional). 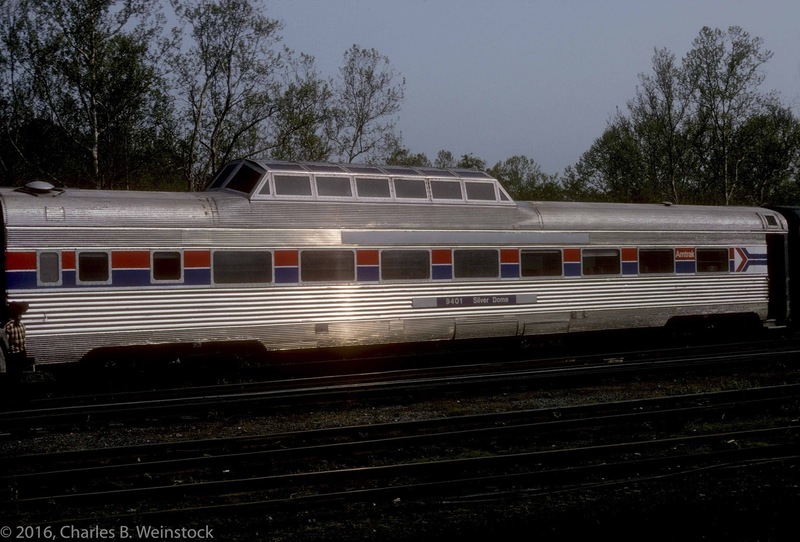 Then, and only then, should Amtrak have worried about making the cars pretty. Carpeting on the walls (something they did to "modernize" its inherited cars) is nice, but it doesn't keep you cool in the summer or warm in the winter. Anyone riding the special could see that the official was right. Although the Western Maryland car had not been carpeted or reupholstered, almost everyone on board rode in it; it was much more comfortable. The passenger list for this historic last run consisted of members of the press, conservationists, VlPs, railroad officials, and at least two very lucky railfans. 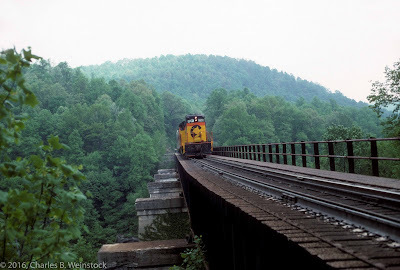 The conservationists were aboard because the railroad is giving the Western Pennsylvania Conservancy the abandoned right of way between Connellsville and Frostburg for use as a recreational trail, railfans will soon be able to hike or bike where mighty Decapods once pounded. At 7;00 a.m. the train left Pittsburgh from the Baltimore & Ohio's Grant Street commuter station, and used that railroad's tracks for the 58 miles to Connellsville where it switched to Western Maryland track. After a press briefing at Bowest Yard, the real trip began. To me it was just like a typical railfan excursion; complete with fighting for the vestibule windows! (Some of the press can be amazingly pushy.) To make the feeling complete, the railroad even provided a photo runby. Just outside of Ohio Pyle, at bridge 2379, the train paused to let everyone off. As I walked across the bridge to get in position for a good shot, l noticed that about half a dozen railfans who had bean chasing the train had already taken the beat spots. As l got closer, I recognized some of them as friends. When they recognized me and realized that I had managed to get on board, the looks that they gave were priceless (and deadly). Two of the fans who were previously unknown to me became life-long friends with me: Ivan Abrams and Bill Metzger. We would go on to railfan all over Western Pennsylvania, Northern West Virginia and Eastern Ohio until I finally finished my degree at Carnegie Mellon University. From Ohio Pyle to Confluence, Pennsylvania we had to use the tracks of the B&O on the opposite bank of the river. The Western Maryland had jumped the gun a little, and had already started to remove a bridge at Ohio Pyle. One had the feeling that they were tearing up the tracks as soon as our train had passed over them. At Confluence, the train paused to let off a TV crew and then headed for Rockwood, back on the Western Maryland tracks. From Rockwood our route took us to Meyersdale. After tunneling through Big Savage mountain and taking in the magnificent view of the Cumberland valley on the other side, it wasn't long before we found ourselves first in Frostburg, Maryland and then in Cumberland where some more of the press got off. From Cumberland to Hancock our route paralleled and repeatedly crossed the C&O Canal (whose towpath is another recreational trail). The special arrived in Hancock at 5:15 p.m., and there were Greyhound buses waiting to take us back to Pittsburgh. 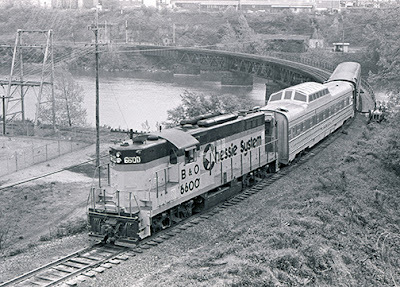 Being a true railfan, l ascertained that it would be possible to accompany the Silver Dome and 6600 on their special movement back to Pittsburgh. When it became apparent that this train wouldn't arrive back home until at least 3:00 a.m., I decided to get on the Dingy Dog and call it a day. 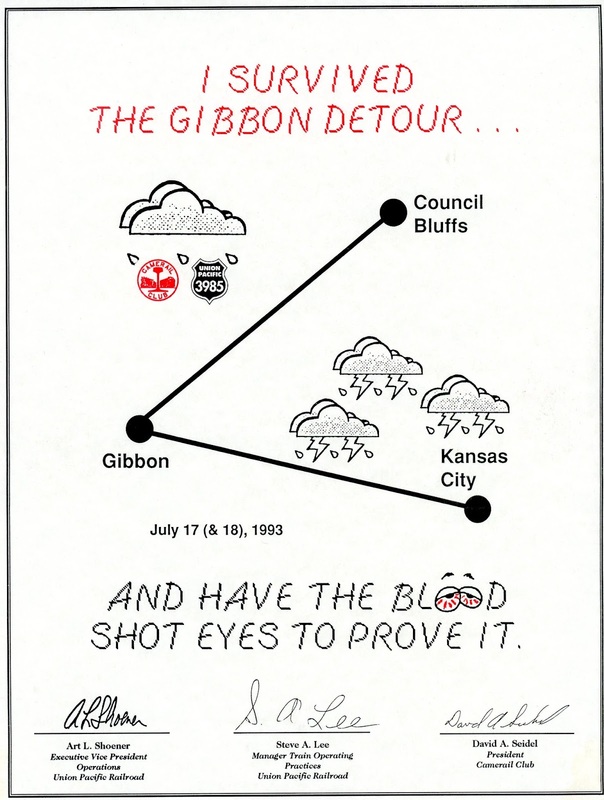 On July 27, 1993, I had just returned from a 11 day trip that included riding the Challenger from Omaha to Chicago, the Arkansas and Missouri, and the Frisco line from Tulsa to Enid when I wrote this. I left Pittsburgh on Friday, July 16. I flew to Omaha (I elected not to ride the California Zephyr as it detoured over the C&NW for two reasons: I wasn't positive that it would get to Omaha in time, and I didn't like the idea of sitting up all night. It turns out that the connection was made, and I could have shared a room with someone...oh well.) Approaching the airport I looked down and noticed fields with water in them. It looked like rice fields in Arkansas, but this wasn't Arkansas and it wasn't a rice field. At Omaha some friends met me, we checked into the motel, and went off for a good steak dinner. According to the UP, the Falls City Sub was out of service and the train would detour via Marysville. This was a tad dismaying because most of our group had ridden a Omaha to Marysville trip two years ago. Then we learned that we would not be using the Beatrice Sub, but instead would be detouring via Gibbon Jct. This made almost the entire trip (from Valley Jct. to K.C.) new mileage. UP 3985 and little buddy. Date unknown. We awoke early on Saturday and piled onto school buses for the Council Bluffs yard. The train was awaiting with no fewer than 6 dome cars. The UP excursion train is still a damn fine sight. As I recall the train left almost on time, and we were off towards Gibbon Jct. (for once the rumor mill was correct). The train was being pulled by diesels to Marysville where the 3985 was awaiting us. We made excellent time, but had no runbys. Instead of a 280 mile trip, this would be a 480 mile trip! The high point of the day was probably speeding through the Nebraska and Kansas countryside with lighting flashing all around us and rain pouring down so hard that you couldn't see out the windows. There was water everywhere, up to the rails in some places. The low point of the trip was at Kansas City. As we approached Neff yard, a 10:30pm arrival seemed possible. We were held outside the yard for a while, and then moved up to the approach tracks. Then we sat...and sat...and sat. They watered the train, took off the steam engine, and eventually hooked a diesel onto us and see-sawed us into the designated track for off-loading. It was past 1:30am when we got off the train. Rumor has it that the local yardmaster wasn't going to let a passenger train upset "his yard". Rumor also has it that he was relieved of his duties the next morning. (There was some speculation that he had come over from New Haven yard on the NS :-) The buses to the motel were not right there when we got off, and the club operating the trip all but abandoned us for a good while leading to some extremely bad feelings. I was able to share a taxi with a few others while others waited for the bus, but it was still near 2am when I staggered into the motel. While riding the taxi, I had managed to sell my Sunday ticket for the ride to St. Louis. The train would be going over the Sedalia Sub instead of the advertised River Sub and I didn't need the mileage. (And I certainly needed the sleep.) A bunch of us slept in with the idea of either flying ($49) or renting cars depending on the price. We awoke at 10am, and 7 of us rented two Chevrolet Caprices to drive to St. Louis for $30 a person. The drive across Missouri was uneventful, punctuated by a stop at a Steak 'n Shake or two. The most impressive sight was the crossing of the Missouri on I70. At first it just looked like a wide river. Then we noticed the silos and barns poking out of the river along with some railroad signals. No wonder the River Sub was closed. St. Louis was hot, and wet, and we pretty much stayed near our hotel (the Drury Inn at Union Station...an old railroad Y). I bought a shirt in the lobby that said "I've had it up to here with the Mississippi" which pretty much summed up the local feeling. Up again at 6am on Monday to catch the buses to the loading site in St. Louis (I think it was called the compress track, but I'm unsure.) The trip to Chicago would be old mileage until Findlay, then new mileage until Woodland Jct. (where the old C&EI line to Evansville joined us). The trip was uneventful and on-time. The first runby was made in the same spot where I got attacked by chiggers during the NRHS convention a few years ago. I elected not to leave the train. (I put on "deep woods off" to make sure that they didn't get me by boarding the train.) Apparently I'm famous from this incident in 1989...at least one person came up to me and said that they were all hoping I'd be out there to attract all the chiggers away from them! (There were several other runbys and I actually got off the train at one or two of them.) The service stop was at Villa Grove, and it appeared as if the whole town was out to greet us. Besides the new mileage and completing the C&EI route from St. Louis to Chicago, a highlight of the trip was meeting and talking with Jon Roma and Dave Rasmussen. We arrived in Dolton (18 miles from the loop) at just past 7 and I was at the Palmer House by 8. A friend was supposed to have called my parents to let them know I was enroute, but he forgot. It didn't matter because they couldn't come get me anyway and asked me to go over to Northwestern Station and catch a commuter train out to Highland Park. I was there in plenty of time for the 8:35 and at my folks house by 9:30. After two and one half days in Chicago, I found myself at O'Hare on Thursday afternoon to catch an American Airlines F100 to Tulsa. There a friend and I rented a mini-van, and awaited the arrival of two more friends (also coming from Chicago...four of us travelled on 3 different planes...we wouldn't want to deprive the railfan community of all of us in the case of a crash :-) We then drove to Springdale, AK where we checked into the Roach Motel. (Actually a Heartland Lodge, but you could have fooled me.) We were met there by two other friends, and five of us rode the Arkansas and Missouri railroad (an ex-Frisco branch) from Springdale to Van Buren. This is a nice operation, with sparkling clean Alco power, and nicely restored commuter coaches from the 20's. The train usually runs as a mixed, and we had some 41 cars out of Springdale. We left at 8am, made one switching stop, and were in Van Buren before 11:30, where the six person met us with the van. After lunch in Ft. Smith, we dropped three of the guys at the train to ride north, while three of us headed back to Tulsa for some needed R&R. (Did I mention, yet, the heat? It was in the upper 90's and very very humid.) We got back to Tulsa in time to pick up another friend who was flying in from Chicago, and go have dinner at the Metro Diner in Tulsa. Did I mention the heat? 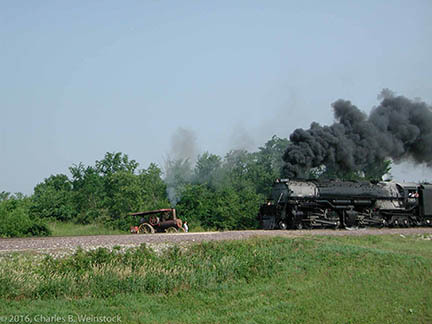 It was very, very, hot, and very, very humid when we awoke on Saturday for the 9am departure of the Cherokee Strip Express to Enid. This was a motley train, consisting of a number of cars from the Memphis Transportation Museum, some from the Kiamichi Railroad in Hugo, OK, and various other cars. The last several cars were BN business train cars and were reserved for officials including the Governor of Oklahoma. We dropped three of our party at the train, and went off to find the first place to take its picture. As the train passed us we first became aware of the fact that there was little working A/C on the train when one of our party, standing in a vestibule, made an exaggerated brow wiping motion to us. Have I mentioned that it was hot? The leisurely 10am(!) departure on Sunday meant two things: we'd be able to sleep in, and we'd be sure to catch the hot part of the day. We were about to board our assigned car when a PA announcement told us to board a different car (the A/C wasn't working). Expecting the hell our friends had experienced, we boarded the new coach. Much to our surprise, it was pleasantly cool, and remained so all the way to Perry, our lunch stop. (Another 3 hours!) We found our friends at Perry and had lunch at another Braums and then sat in the van with the A/C on high until it was train time. We boarded a still cool car and actually left Perry a few minutes early. Less than a mile outside of the station the A/C quit on our car. Within minutes it was incredibly hot. They passed around Gatorade, and water, and wet towels, but finally, about 8 miles from Tulsa the asked us all to leave the car. We had been doing about 1 mph past a stretch of tight track and things had gone from bad to worse in the car. They put is in the trailing car and as we walked in we all felt like we would get pneumonia. It was freezing. Most people from our car were standing in the aisles, but we were able to find a pair of seats and chatted with the lady across from us. While we were freezing she was complaining about how hot it was in the car. An old gentleman in the other seat across from us had an obvious case of heat stroke. It was hot. Due to the tight track, the train pulled into Tulsa at about 5:30, an hour late. We got off the train into the hot Tulsa sun, and into the air conditioned van for the ride to the motel where we cranked up the A/C, and then headed for a Tulsa Drillers (Texas League AA) vs. San Antonio game. The home team won, and we had a good time, in spite of the still stifling heat. A little dessert at the Metro Diner, and off to a shower and bed. That Monday (July 26) I caught a 7:30 flight to Chicago and then Pittsburgh, looking forward to getting away from the heat and humidity. Somehow though, during the weekend, the weather in Pittsburgh had turned from great to essentially the same as Tulsa's. I suspect there was only a 5 degree difference. I was exhausted from my vacation. I'd probably lost 10 pounds (but it was all water sweated away, so it doesn't count). The last few days weren't as much fun as I had hoped. But I GOT THE MILEAGE!